As hybrid cloud environments increasingly become the norm, unfortunately, legacy backup and recovery architectures just can’t keep up. Homegrown scripts and manual backup processes often have gaps in protection as apps come and go, and as workloads move from on-premises to the cloud. What’s worse, enterprises that amass a variety of point solutions for each data protection use case end up creating the same silos that IT has wrestled with for decades. The end result is fragmented data that is difficult to extract value from. This white paper offers an alternative, with a cloud-agnostic architecture that spans all data protection needs across cloud and on-premises data. 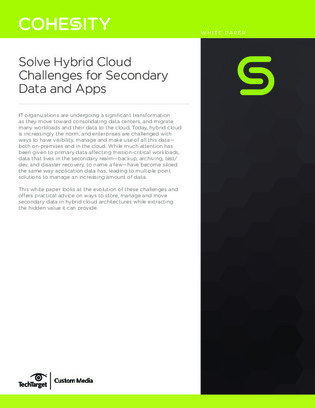 Download here for a method of overcoming fragmented backup, recovery, and archiving that often persists in hybrid cloud environments.